The 1999 Annual, Volume 2: Consulting continues the Pfeiffer Annual tradition of providing trainers, consultants, facilitators, and managers with the tools they need to make organizations more effective. With a focus on consulting, this volume offers Experiential Learning Activities, inventories, questionnaires, surveys, and resources for topics including leadership, problem solving, team development, facilitation, and more. Rich in practical content and geared toward forward-looking vision, this book provides consultants with an exceptional resource for professional development. 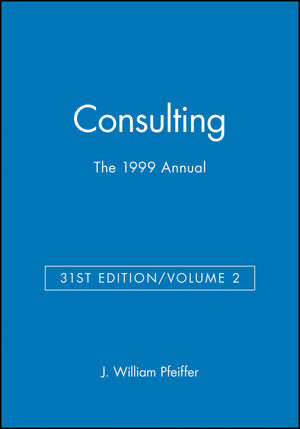 J. William Pfeiffer is the author of The 1999 Annual, Volume 2: Consulting, Agency Edition, published by Wiley.